A load balancer is a useful service that distributes workloads across multiple servers. Load balancing increases fault tolerance to your site and improves performance. In this how-to, we will guide you through installing NGINX and configuring NGINX to do Round Robin load balancing. For this guide, we will be using Ubuntu 14.04. Below is a network diagram that is an overview of how this is being set up. A server with Ubuntu 14.04 installed. 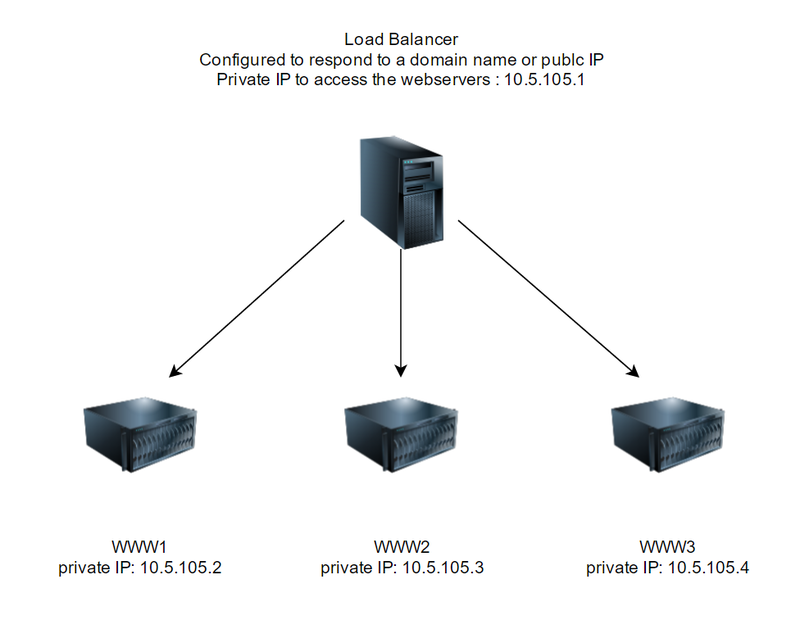 Two or more web servers that can be accessed by your load balancer. See our LAMP or LEMP how-to’s for help on installing a web server that sits behind your load balancer. Since the default configuration is set up for a basic website, we can remove it and add in the following configuration. We are adding upstream to our configuration, which is an NGINX module that enables load balancing. In upstream replace the private IPs in this example with your web servers. You can use private IPs, public IP’s or hostnames and you are going to want to set the server_name to you domain name or IP address. You can set the upstream name to whatever you would like, just so long as it is the same on the proxy_pass. In this case, we are using the name www. Essentially, this configuration enables NGINX to listen for you Domain name or Public IP and once it is accessed, it passes traffic to the next web server in the round robin sequence. You can then test it out by going to your hostname or IP of your load balancer in your browser. For testing, we have 3 default NGINX servers sitting behind our load balancer, each with a slightly modified index page. With the configuration above, our load balancer is distributing the load equally across our 3 servers. However, there are cases in which you may want a particular web server to take on more traffic than another. To accomplish different distribution, we can add the NGINX weight directive. The default weight is 1, which the example above uses. If we want our 1st webserver to take 50% of our traffic we could use the following configuration. You can experiment with different weights per web server to make your ideal configuration. Remember to always restart NGINX when adding to your configuration files. However, if a user kept refreshing their page, it might be confusing to them that they keep getting different pages. We can fix that with IP hash. To eliminate confusion, add ip_hash to your upstream configuration. IP hash works by using your client’s IP address as a hashing key so that your client will always goes to the same web server. Below shows an example of adding IP hash. Remember to restart NGINX when making the changes. Congratulations on adding load balancing using NGINX! You might want to take a look at the Module ngx_http_upstream_module page for more NGINX directives you can add. Thank you for following along this how-to, please check back here for more updates or to learn more about our reliable HIPAA-compliant cloud hosting solutions.